I kind of lost my mind last night. It was somewhere around the 30th time I had passed the marker indicating the edge of the sweater without so much as a decrease or a color change. I went and cast on two new projects, along with digging up all of the WIPs. From left to right, top to bottom: The Noro Striped Scarf some people might remember from my post back in December, a slouchy hat using Rowan Lima,* the wolf mitten from the same post as the scarf, half a sock foot, most of a striped shawl, the beginnings of a doll, and, of course, The Sweater. Which is up to 19 hours and 15 minutes, by the way. 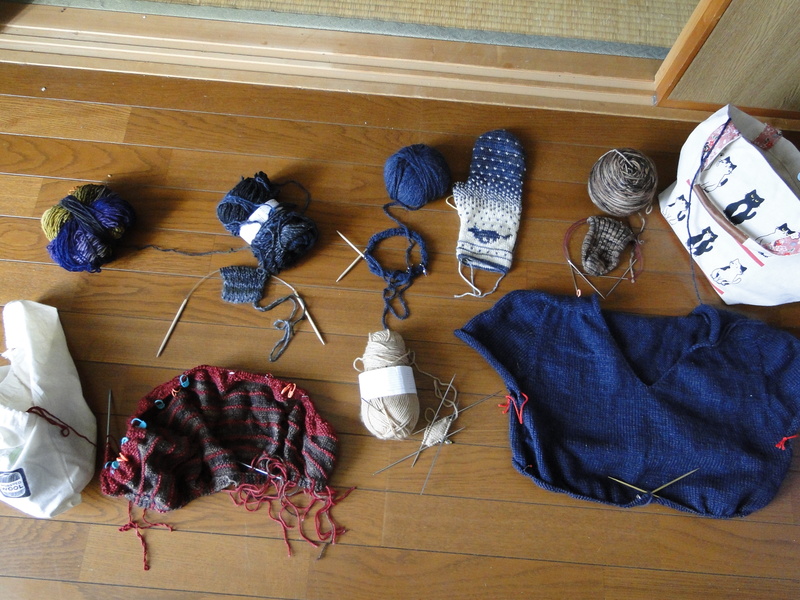 I’m hoping to turn all of these into a parade of finished objects by June, as mad as that sounds. *This kind of kicked off the spree – started the hat, noticed it was the same color as the sweater, went yarn hunting, found a couple of WIPs and the doll yarn. Good luck getting all that done! !